A birth certificate is an official document that indicates and records a person’s birth. A birth certificate lists down the name of the individual, date of birth, place of birth, and parentage. 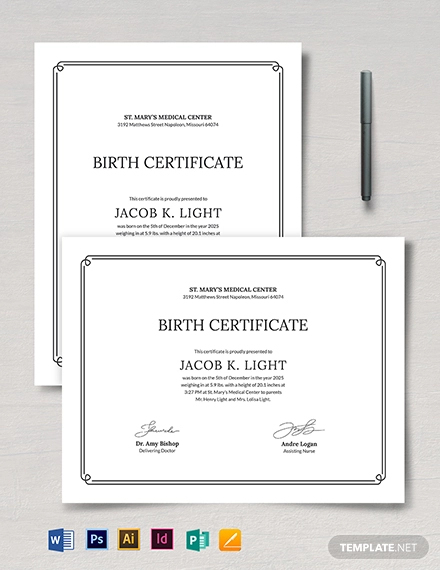 In this article, we have provided birth certificate examples and templates that can help you in creating your own birth certificate. We also listed down simple tips as well as the steps in creating a birth certificate. 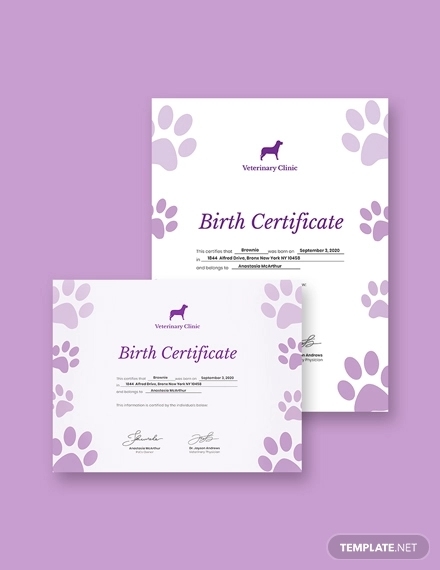 A birth certificate is not difficult to create and only includes a few elements. Make sure to include all the elements listed below to make the birth certificate effective and detailed. Name of the individual: The name of the individual is one of the most important aspects of a birth certificate. The name of the individual should be spelled out, including the first name, middle name, and surname. Suffixes should also be listed if the person has one (i.e. Jr., Sr., I, II, III, etc.). Date of birth: The date of birth is another important aspect of a birth certificate. The birth month should be spelled out while the day and year should be specific. The date of birth should be 100% accurate as this will cause problems for the individual in the long run especially if he will be applying for a travel visa or getting a loan.You may also see modern certificate examples. Place of birth: The place of birth should be very specific and it should include these information: district (borough), city (town), and country. All of these information should be included in the birth certificate, and if one information is lacking, it makes the birth certificate invalid. Parentage: The names of the individual’s parents should be also be listed in the birth certificate. If the individual is adopted with knowledge of his or her previous parents, then the birth certificate should be amended and the names of the new parents should replace the previous ones. If the individual does not have knowledge of his previous names, then the names of his adoptive parents should be written in the birth certificate. The names of the father and mother should be completely spelled out (with suffixes included if applicable).You may also see sports certificate examples. Signature and/or stamps: A birth certificate is a government document, that is the reason why a signature and government stamps should be included. It is not your job to affix your signature on the birth certificate nor add the stamps, as the relevant government offices will be doing this task. 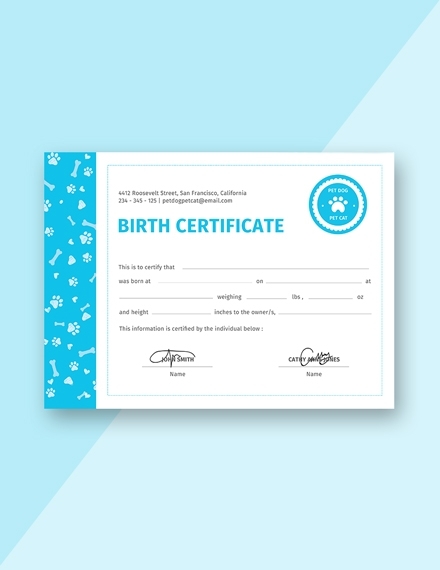 The focus of a birth certificate should be on the details, such as the name of the individual, place of birth, date of birth, and parentage information. There is no standard format for the order of the information, just make sure they are arranged properly and all information is clear and readable. As previously mentioned, the information that you will provide should be concise and avoid using abbreviations especially for the name. A birth certificate is not a document that requires long descriptions such as sentences and paragraphs. There is no need to describe each detail in the birth certificate (for example, why the individual was given that name or describing the hospital where the individual was born). 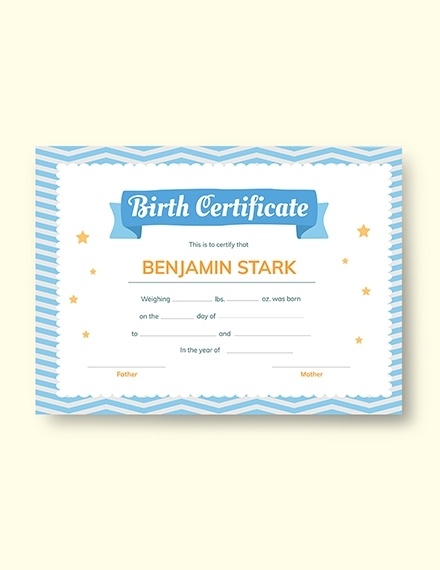 The details in the birth certificate should only be listed in bullet form and should really not take the entire space of the paper.You may also see award certificate examples. The signature line is an important section of a birth certificate. Although it is not your job to affix your signature in the email signature, you should make sure the persons who will be writing down their signatures in the birth certificate are available when their signatures are needed. The signature line should be placed at the bottom left corner or bottom right corner of the birth certificate. 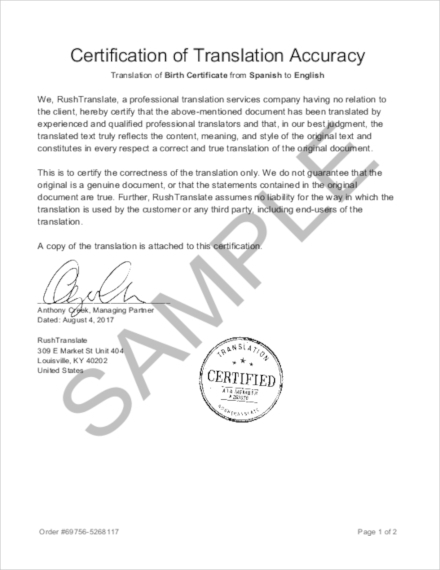 The birth certificate is a formal business document, so the use of graphics or images should be avoided. The only images that need to be used in a birth certificate are the stamps and government logos, which should not be your concern. 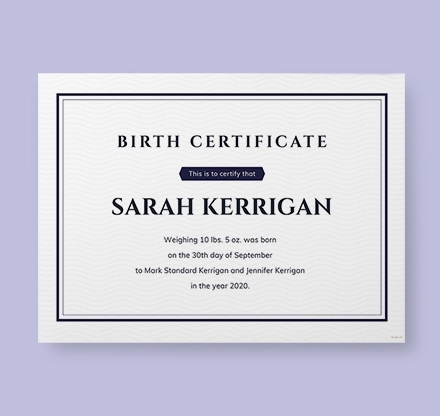 Rather, just add borders in the birth certificates (thickness should be 0.5 to 1 inch on all sides). Also, avoid using different colors for the text (i.e. red for the name, blue for the date of birth) as this also looks unprofessional. Before you start creating the birth certificate, you should first gather the necessary information. 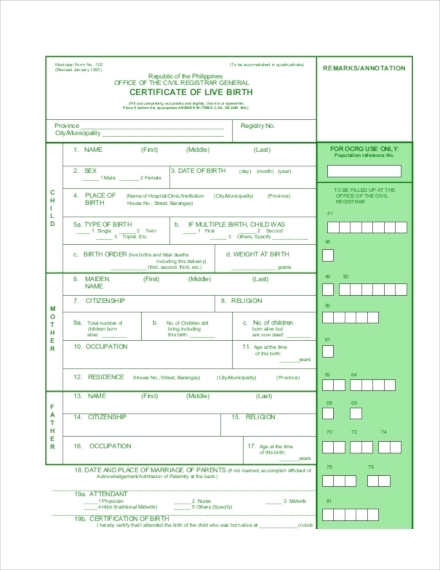 These information includes the full name of the individual (first name, middle name, surname, and suffix if applicable), date of birth (day, month, year), place of birth (borough or district, town or city, country), name of parents (mother and father), date of birth of parents, and place of birth of parents. Take note that all information should be very specific and if one information is lacking, it would make the birth certificate invalid. A birth certificate does not require a lot of materials. You only need paper and maybe a few pens and markers for the signature. Remember that this is only a birth certificate, and there is no need to heavily invest on the materials you are going to purchase. There are hundreds of stores where you can purchase paper (and pens), choose the stores that sell the most affordable materials yet having good quality.You may also see training certificate examples. Once the materials have been purchased and the necessary information have been gathered, it’s now time to create the birth certificate. As previously mentioned, there is no standard format for a birth certificate (i.e. font size, font style, arrangement of text, etc.). But remember that the birth certificate is still a formal business and government document, so use formal or professional font styles such as Arial, Times New Roman, Cambria, Didot, Garamond, Helvetica, Georgia, and Calibri. The text can be of identical font size or font style. It will also be your discretion on the placements of the text, but it is advisable to place the name of the individual at the upper part of the birth certificate, preferably at the center. The other details can follow below the name.You may also see donation certificate examples. When creating the layout, you can sketch the layout in a piece of paper or go directly to a graphic design software such as Illustrator or Corel. 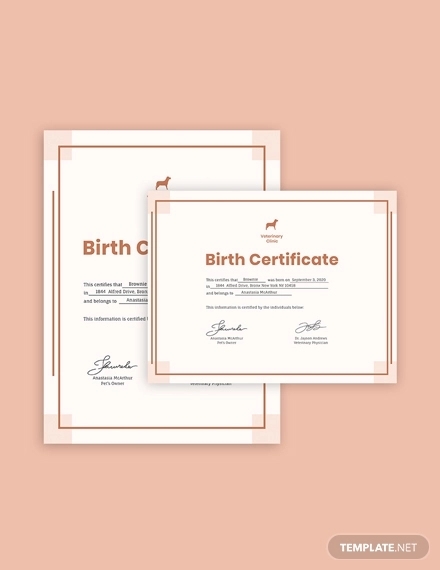 If you are working with a partner or with a team when creating the birth certificate, don’t cancel them out immediately and listen to their suggestions, they might have some ideas to make the birth certificate more specific and detailed. Before you print out the birth certificate, you need to double-check for typographical errors. A birth certificate with numerous misspellings does not bode well for the holder of the certificate. The individual also cannot use the certificate if there are numerous errors. An award or recognition certificate is basically given to an individual who has received an award or a recognition. This type of certificate uses a landscape format and can be used in different fields and industries, either in the private or public sector. This type of certificate uses a landscape orientation. An academic certificate (diploma) is a type of certificate used for academic purposes only, mainly given during the graduation of a student. A diploma is given to a student who has graduated from grade school, high school, college, or masters/PhD, and is only given out to students who have completed all their academic requirements and passed all of their subjects. This type of certificate also uses a landscape orientation. A certificate of employment is a form of business certificate. This type of certificate can only be used by business professionals or individuals who are employed by a company. The certificate of employment acts as a proof or verification for the person working in the company, and this certificate is oftentimes used by an individual to get a loan or to apply for a new job. 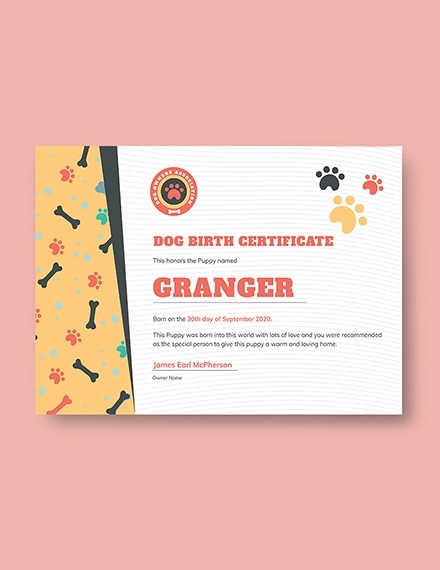 This type of certificate uses a portrait orientation. A government or legal certificate is similar to a business certificate, but is mostly used for government (or legal)-related activities and purposes. Government projects, agreements and contracts, stakeholder meetings, government meetings or assemblies use a government or legal certificate. 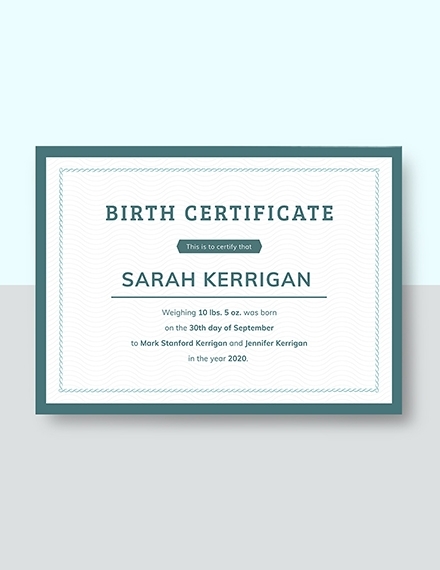 This type of certificate uses both a portrait and landscape orientation depending on the use. 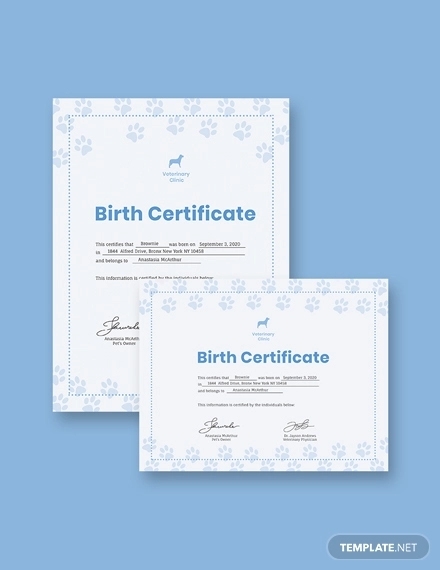 8 1/2″ × 11″ – This is the standard size not only for a birth certificate but for most of types of certificates, especially business and government certificates. 11″ × 14″ – This certificate size is commonly used for graduation diploma purposes, especially in post-graduate courses such as medicine, law, and and masters/PhD courses. 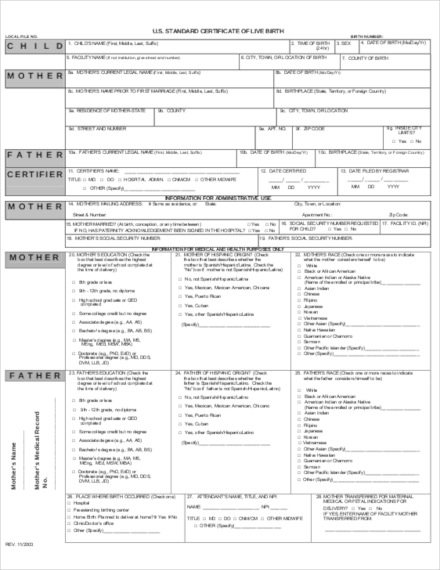 15 3/4″ × 22″ – This is the biggest size that can be used for a birth certificate, but only use this as a last option. This certificate size is also used for academic certificates as well as award/recognition certificates. How do you make a birth certificate? Follow these simple steps when creating a birth certificate: (1) gather all the necessary information, (2) purchase the materials needed for the certificate, (3) layout the details in the birth certificate, and (4) edit and revise if necessary. 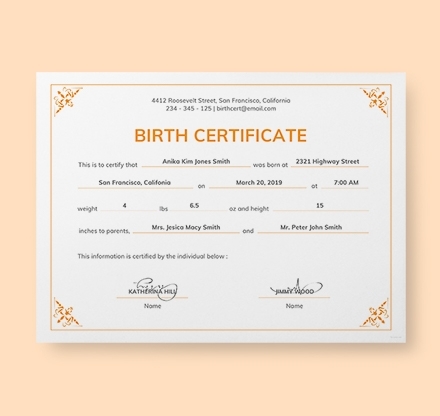 Why is a birth certificate important? 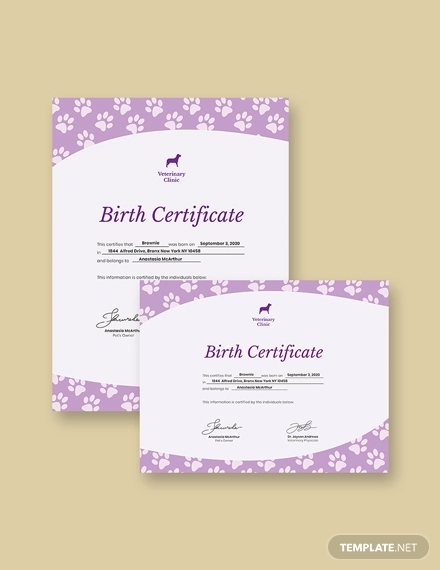 The types of certificates aside from a birth certificate are: award or recognition certificate, academic certificate (diploma), certificate of employment, and government or legal certificate. 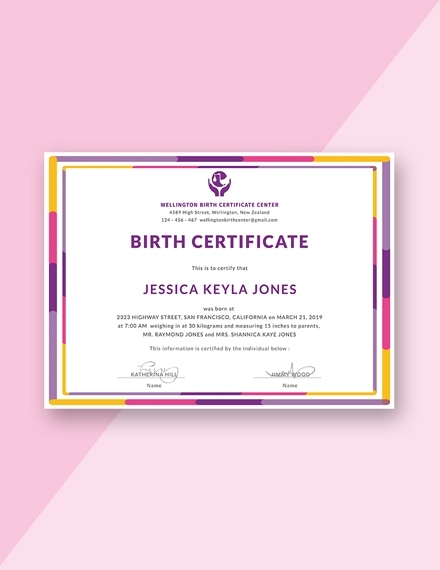 We hope you found this article to be informative as well as helpful when you will be creating your own birth certificate. Creating a birth certificate is not difficult, as you will just have to follow the instructions we listed above.